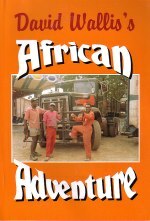 Between 1994 and 1996 David Wallis and David Taylor, accompanied by a small group of North West Showmen, undertook an epic tour of Southern Africa. David Wallis kept a diary throughout his extensive travels, and this is his story of their adventure. By the time you have finished reading through this story you will have felt that you actually accompanied David and his fellow travellers on that journey. You will picture the former colonies and the old imperial buildings; the characters will seem like people you know, it is all so realistic.